Michael Joseph Jackson (August 29, 1958 – June 25, 2009) was an American recording artist, dancer, singer-songwriter, musician and philanthropist. 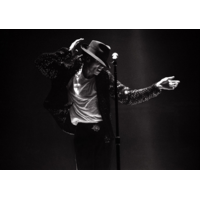 Referred to as the King of Pop, Jackson is recognized as the most successful entertainer of all time by Guinness World Records. His contribution to music, dance and fashion, along with a much-publicized personal life, made him a global figure in popular culture for over four decades. The eighth child of the Jackson family, he debuted on the professional music scene along with his brothers as a member of The Jackson 5 in the mid-1960s, and began his solo career in 1971. In the early 1980s, Jackson became a dominant figure in popular music. The music videos for his songs including "Beat It", "Billie Jean" and "Thriller", were credited with transforming the medium into an art form and a promotional tool, and the popularity of these videos helped to bring the relatively new television channel MTV to fame. Videos such as "Black or White" and "Scream" made him a staple on MTV in the 1990s. Through stage performances and music videos, Jackson popularized a number of dance techniques, such as the robot and the moonwalk. His distinctive musical sound and vocal style have influenced numerous hip hop, pop, contemporary R&B and rock artists. Jackson's 1982 album Thriller is the best-selling album of all time. His other records, including Off the Wall (1979), Bad (1987), Dangerous (1991) and HIStory (1995), also rank among the world's best-selling. Jackson is one of the few artists to have been inducted into the Rock and Roll Hall of Fame twice. He was also inducted into the Dance Hall of Fame as the first (and currently only) dancer from the world of pop and rock 'n' roll. Some of his other achievements include multiple Guinness World Records; 13 Grammy Awards (as well as the Grammy Legend Award and the Grammy Lifetime Achievement Award); 26 American Music Awards (more than any other artist, including the "Artist of the Century"); 13 number-one singles in the United States in his solo career (more than any other male artist in the Hot 100 era); and the estimated sale of over 750 million records worldwide. Jackson won hundreds of awards, which have made him one of the most-awarded recording artist in the history of music. He was also a notable humanitarian and philanthropist, donating and raising hundreds of millions of dollars for beneficial causes and supporting more than 39 charities. Aspects of Jackson's personal life, including his changing appearance, personal relationships and behavior, have generated controversy. In 1993, he was accused of child sexual abuse, but the case was settled out of court and no formal charges were brought. In 2005, he was tried and acquitted of further sexual abuse allegations and several other charges after the jury ruled him not guilty on all counts. While preparing for his concert series This Is It, Jackson died on June 25, 2009, after suffering from cardiac arrest. Before his death, Jackson had reportedly been administered drugs such as propofol and lorazepam. The Los Angeles County Coroner declared his death a homicide, and his personal physician pleaded not guilty to charges of involuntary manslaughter. Jackson's death triggered a global outpouring of grief, and as many as one billion people around the world reportedly watched his public memorial service on live television. In March 2010, Sony Music Entertainment signed a US$250 million deal with Jackson's estate to retain distribution rights to his recordings until 2017, and to release seven posthumous albums over the decade following his death.